Every year the FSSAA, which is the national sports and welfare body for the fire service, organise a national teams of 4 competition. 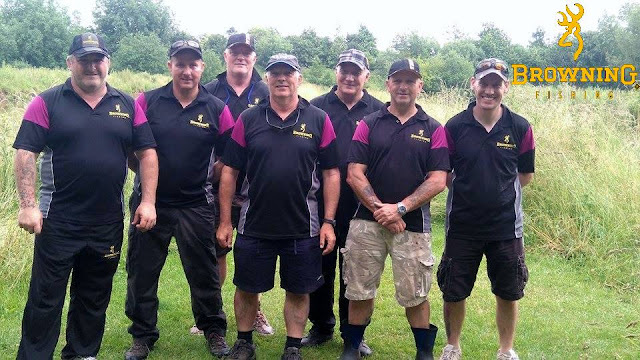 This years match was held at the beautiful and wonderfully scenic Viaduct fishery in the heart of Somerset. This was to be our first outing since our Humberside Fire team joined forces with Browning. We decided due to the 4 and a half hour drive to get to the fishery from Hull, that we would travel down the day before. On our arrival in Somerton we headed straight for the fishery. The plan was to try and get a feel for how the venue was fishing and what areas would be best; however within minutes of our arrival, we managed to get collared into helping weigh-in the part of the open match that was been held over a number of the lakes. The section we weighed in was Cary Lake, which is renowned for its huge resident Carp. On weighing in this became even further evident as one angler weighed-in 2 fish for 38lb! After the weigh-in and a bit of a chat, we completed a circuit of the lakes before making our way to the hotel. Morning arrived and after a hearty full English breakfast, we made our way to the venue. The weather though was terrible and we were due rain all day. Oh and it did nothing but, all blooming day! Draw time arrived and we drew 3 pretty decent pegs (from what we had seen the previous day) and 1 we didn't have a clue about. I drew peg 43 on the Match Lake, John Holness drew 123 on Campbell, Ian Ralph drew 76 on Cary and Mark Davies drew 22 on Spring (the peg we didn't have a clue about) On arrival at my peg I was pretty pleased as I had loads to go at. An island, open water and a really fishy looking margin. What more could I ask? Apart from the weather to book its ideas up! After chatting to a local lad the day before, I knew the lake contained a huge stocking of F1s, which suited me down to the ground. With this is mind I decided on a 4 pronged attack. Firstly a bomb to the island, with an island been such a fish holding feature it would be suicidal not to target this area. The second and third line of attack was to be a pole line at 13 meters aiming slightly to the right, both on the deck and shallow. The reason behind aiming slightly right was so that I wasn't dragging the bomb over the pole line all the time when retrieving it. The 4th line was to be to the reedy margin to my right hand side. Hook - Size 16 Kamasan B911 XS tied with a knotless knot with a hair rigged band. I started the session on the bomb with a banded 8mm pellet. I casted it nice and tight to the island and started firing 3 or 4 8mm pellets over the top. In-between firing the 8 mm pellets, I was also firing 6 mm pellets onto the 13 meter pole line. My hope was to get the fish nice and settled on the pole line before going on it. After a couple of casts on the bomb, a liner was suddenly followed by a proper wrap round. The fish kited immediately left and straight under a overhanging tree, where it shed the hook into a branch. Bugger one nil to the fish. The next cast saw it two nil to the fish, this one snapped me. Fortunately I had 2 identical bomb rods set up, so with no time wasted I was back out fishing right away. Straight away after casting I was getting indications that fish were in the swim, a minute later the tip wrapped round and this time I was not going to let the fish anywhere near that bloody tree. This resulted in a proper chunk F1 around the 3 lb Mark. I decided to give the bomb line a rest for a while and have a look on the pole. I baited up with a 6mm hard pellet and shipped the rig into position. Seconds after the rig settled the float dipped, a quick lift of the pole and a steady stream of white elastic emitted from the top kit. Another decent F1 was soon landed. I had a couple more fish before the bites started to become iffy. A switch back to the bomb saw me into fish straight away. The rest had done the swim wonders. This was to be my tactic for the majority of the match. 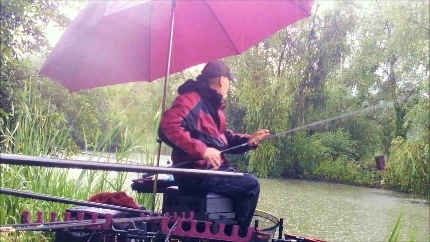 Towards the end of the match, the rain lulled for 20 minutes and my constant feeding saw the fish start swirling. For 20 minutes I couldn't get the rig in quick enough I must have had 12 fish in 12 drops, with a couple of the fish been proper Carp. The rain soon put a dampener on this again as it decided to proper hammer it down, this seemed to unsettle the fish. I remained on the shallow line for the remainder of the match just picking up odd fish as the other lines just stopped producing. I did give the edge line a few goes but I could not get a bite. At the weigh in I was really pleased when I weighed in 80lb this was enough to win the lake. On return to the carpark, the other lads told of their days. John had 105lb Ian had 37lb and Mark had really struggled as he had 12 lb. At present I still don't know where we actually finished as we left before the presentation, as we had a supposed 4 and a half hour drive back, which actually turned out to be nearer 7 due to the blooming M1 roadworks. I will update you when we get confirmation of the result.